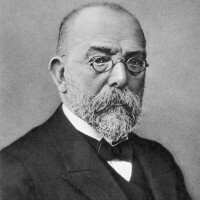 Robert Heinrich Hermann Koch (11 December 1843 – 27 May 1910) was a celebrated German physician and pioneering microbiologist. As the founder of modern bacteriology, he is known for his role in identifying the specific causative agents of tuberculosis, cholera, and anthrax and for giving experimental support for the concept of infectious disease. In addition to his innovative studies on these diseases, Koch created and improved laboratory technologies and techniques in the field of microbiology, and made key discoveries in public health. His research led to the creation of Koch’s postulates, a series of four generalized principles linking specific microorganisms to specific diseases that remain today the "gold standard" in medical microbiology. As a result of his groundbreaking research on tuberculosis, Koch received the Nobel Prize in Physiology or Medicine in 1905.